Home Gadgets News Touch exquisitely with Acer Aspire 5600U and 7600U all-in-one PCs! Touch exquisitely with Acer Aspire 5600U and 7600U all-in-one PCs! With the latest developments in gaming, home entertainment and social networking, however, the design roadmap is again shifting. The all-in-one PC has evolved from a 15-inch dressed-down computer integrating the processor and chipset, to a bigger, more powerful home or office device designed to handle more than just desktop applications. Ushering in the future of all-in-one desktops, Acer introduces to the local IT market its Aspire U series. This gem of an IT device won the Consumer Electronic Show (CES) 2012 Design and Engineering Award for its one-piece polycarbonate stand in floating design. The ergonomic 35-mm ultra-slim PC has edge-to-edge, anti-scratch transparent glass and a matt metal stand that create the illusion of a floating monitor. The L-shaped stand clicks to place when the monitor is tilted. With heightened performance, the Aspire U series accommodates a host of other to-dos for the tech-savvy young professionals who want to be the first to own state-of-the-art gadgets. For your own personal enjoyment or sharing with a few friends, the Aspire 5600U comes with a 23-inch display that can be tilted with one hand to 30 to 80 degrees, creating an entertainment tablet or game console. Its 10-point touch screen allows simultaneous control of the multimedia dashboard, or can be used as a large e-book reader display as well. For increased control and input options, the all-in-one PC comes with an exclusive wireless keyboard and mouse. In addition, Acer has provided the NFC easy tag feature for customized settings. But the Aspire 5600U is more than just a PC. The model incorporates a wide-view display and built-in surround sound speakers for that complete home theater experience. With the Acer CineBoost color engine technology, the PC offers enhanced color saturation and contrast, suitable for HD movies and videos. Its mercury-free LED backlit LCD makes it an environment-friendly device even while delivering images in 1920x1080 resolution. The Aspire 5600U also supports digital video broadcasting and HDTV with an optional TV tuner while its wall-mount kit and optional remote control is handy for home TV or video wall applications. The story does not end there. Taking the awesome features of the Aspire 5600U a notch higher, Acer brings into the market the Aspire 7600U, the latest upgrade with a 27-inch display that offers even more options to enjoy gaming and view multimedia content. 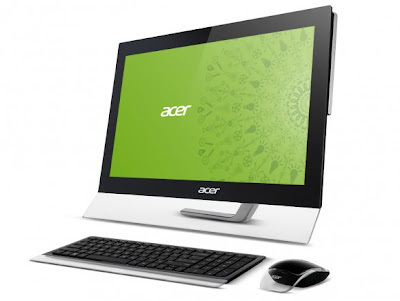 With the Aspire 7600U, Acer gives the all-in-one computing concept a new meaning. Bringing intuitive control and PC interaction to a higher level, the model includes PointGrab, a hand-gesture application that allows gaming geeks and couch potatoes to play, control or select files — and yes, without even touching the PC. All you need to do is wave from about three to four meters away, allowing the app to recognize you, and you can grab and move files as you wish. This function is further supported by a full HD 2MP webcam that allows you to chat live with your friends while working or playing. Moreover, using the Aspire U series as your personal cloud and multimedia center, you can upload files and multimedia content to the AcerCloud for storage and sharing, or for accessing from your tablet or smartphone anywhere, anytime. The Aspire U series is powered by Intel’s third-generation Core i5 and Core i7 processor, Intel HD graphics or Nvidia GeForce GT630M/640M graphics chipset, USB 3.0 with power-off charging for 10x faster data transfer, and Bluetooth 4.0 for rapid file exchange. The Aspire U series runs on the brand-new and ultra-impressive Windows 8 64-bit operating system. It has up to 8GB DDR3 memory, huge 1TB storage, and a Blu-ray disc reader, and supports 802.11b/g/n Wi-Fi and Gigabit Ethernet Internet connection.